The 2018 midterms saw many new Democratic faces, including the highest number of women and people of color, elected to the House. Speaker nominee Nancy Pelosi of California is poised to lead the party with the number two and three in command Democratic incumbents Steny H. Hoyer of Maryland and James E. Clyburn of South Carolina. This experienced leadership is part of what the Democrats need to regain control of the House and make it last. But Pelosi and her team should take constructive steps to prepare the new wave of representatives for leadership roles in the near future. In fact, supporting a fresh second or third in command should be the first step. All three of these Democrats — particularly Pelosi — have been targeted by incoming and returning lawmakers who promised their electors change in the House leadership. Newly elected members Abigail Spanberger, Jason Crow and Conor Lamb are among those who have publicly voiced opposition to her reappointment. However, Pelosi is the only candidate for speaker who has the experience to handle a Republican Senate and president, and she will ensure a smooth transition to a more progressive House in the next few years. Pelosi has a history of attracting donor money that will be vital in pushing certain legislation, especially regarding health care and climate change, through Congress. She also plans to review the Affordable Care Act (ACA), gun safety legislation, an undocumented immigrant legal status bill and the Equality Act. Democrats will have around 232 seats in the House next year, depending on the outcome of three close races. 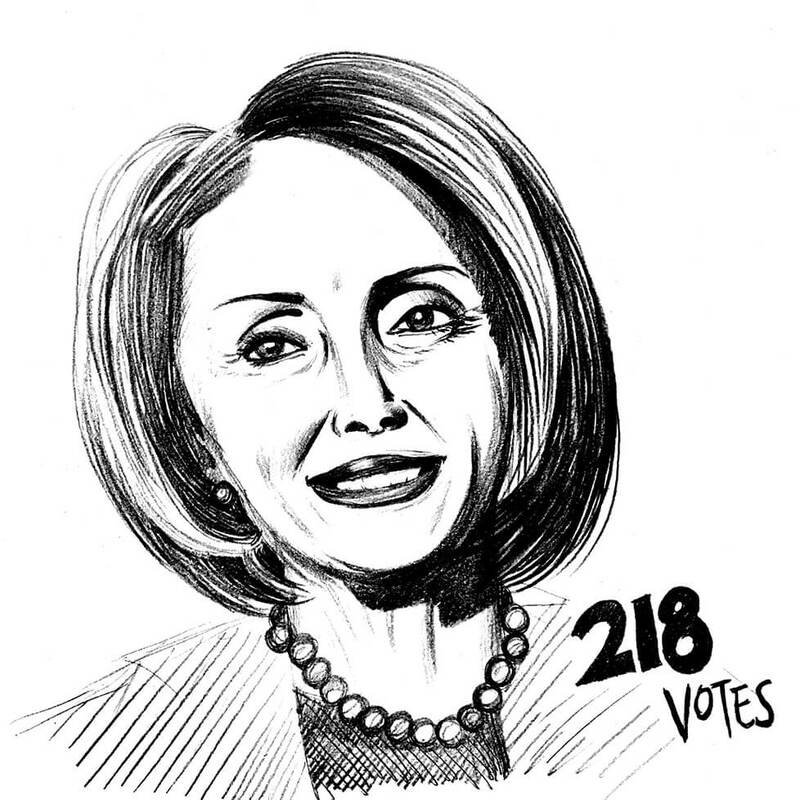 Pelosi will need 218 votes to ensure herself a House victory. As of now, 21 Democrats oppose Pelosi’s appointment, and 16 of them have signed a formal opposition letter. Pelosi will need to change at least eight representatives’ opinion to “in favor” or “neutral.” By voting neutral, representatives take their vote out of the total number of House votes. Anti-Pelosi representatives argue that many new and incumbent Democrats were elected because they promised their constituents that lawmakers like Pelosi would not continue to head the House. These types of lawmakers include wealthy incumbent Democrats who rarely deviate from their position. For example, Elissa Slotkin of Michigan promised in her campaign that she would oppose Pelosi, but now she remains silent on her stance. “I have made very clear, publicly that I would not support Nancy Pelosi as our next speaker,” Slotkin said in late October. Similarly, Gil Cisernos of California promised opposition to Pelosi during his campaign, and now he appears unsure of his decision. If these lawmakers vote against Pelosi, they will force the Democratic party to spend their time finding another less experienced candidate when their focus should be pushing through new progressive legislation. Pelosi, Hoyer and Clyburn have all promised to help train the next generation of Democratic leaders because they know their time in the House is limited. While there are no younger Democrats with the same donor backing and experience as Pelosi, there are some who have signaled to the party that they want to move up, such as Illinois’ Cheri Bustos, New York’s Hakeem Jeffries and New Mexico’s Ben Ray Luján. These representatives are not necessarily qualified to be speaker of the House, but they are good candidates to be second or third in command. In the past, Pelosi proved herself as a speaker who uplifted the voices of younger representatives, especially women. Pelosi passed legislation including a $787 billion economic stimulus package, the Dodd-Frank Wall Street reform bill, student loan reform and the Affordable Care Act — many of which were proposed by younger representatives. In the past, Pelosi has neglected to confront policies on climate change. She hopes to reinstate her 2007–2011 committee on climate change, which Democrats funded; however, Republicans dismantled it after regaining control of the House in 2011. Democrats must propose new policies that cannot be dismissed immediately after the election cycle. If Pelosi’s leadership team were a part of the group of Democrats who campaigned under a promise of change, she would be forced to make more permanent policies. If Pelosi wants to win the 218 votes she needs in January, she should swap Hoyer and Clyburn for two newer representatives who have the ability to look at the House with fresh eyes and a more progressive approach. Democrats must decide whether they want Pelosi to be supported by at least one newer representative, or whether they want a new speaker supported by Clyburn or Hoyer. Pelosi is not the face of the new Democratic party that Democrats, especially young ones, campaigned for during this past election cycle. But she is a vital step to finding a new face to the Democratic party and thus ensuring that it can last. Pelosi will need to be in constant communication not just with a leadership team of new blood, but with the new representatives of Congress. There is no other option besides Pelosi, and she’s the only choice that won’t set the Democratic party back even further. Ellie Findell is an undeclared first year. She can be reached at efindell@oxy.edu.